HALBAN The German company PSI Software AG has started this week its training sessions for Engineering students at the German University of Technology in Oman (GUtech). A specialized Computer Laboratory and Training Center was opened at GUtech last year, after signing a MoU with PSI Software AG. The laboratory showcases a small-scale sample industrial pipeline that is connected to an operation desk. “Our software helps to understand the fluid transportation process within a pipeline. It is a high-end tool to increase efficiency and safety of pipeline operations,” said Dr. Aleksej Lisunkin, Technology Development Manager of PSI Software AG who is currently conducting the block seminar at GUtech. GUtech students who are enrolled in Mechanical, Process and Environmental Engineering will benefit from this unique software as well as our academic staff. PSI Software AG also plans to introduce a thesis programme for Engineering students. “Today’s experiment shows the students an example of a real engineering work, where they are going to detect a leakage in pipelines. This PSI training centre is a unique centre here at GUtech. 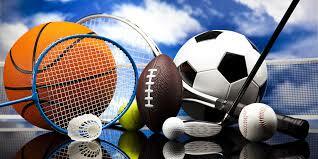 It will contribute to the capacity building of the Omani society. The new centre connects the simulation theory with industrial applications. 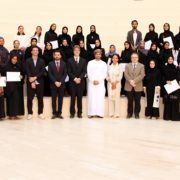 The students will have the opportunity to learn an industrial software “PSIpipelines”, and they will practice the application of simulation techniques” said Prof. Dr. Najah Al Mhanna, Head of the Engineering Department at GUtech. The PSI Software AG is the European market leader for supervision and control systems for gas, oil, electricity, heat and energy transmission and trading. PSI Software AG develops and integrates complete solutions for management of energy flows (gas, oil, electricity, heat, energy planning, transmission, and trading), production processes (mining, metals, automotive, mechanical engineering, logistics) and infrastructure for transport and safety. The PSI Software AG is planning to use the GUtech laboratory as a Training Center for its customers in the GCC region in future. The PSI Software AG was founded in 1969, it is based in the German capital Berlin and employs more than 1,600 persons worldwide, in projects in the US, Europe and Southeast Asia. On the Arabian Peninsula, PSI has delivered the leak detection and location system to the Kuwait Oil Company, for its countrywide gas and condensate pipeline system. Previous prestigious projects in the area of gas management applications include such ambitious and sophisticated installations as GAZPROM control systems for the onshore gas transmission pipeline system supporting Nord Stream and for the entire onshore/offshore gas Blue Stream Pipeline System in Russia. © GUtech/ Text: Dr. Manuela Gutberlet; Photo: Umaima Al Zadjali. MUSCAT An academic information session for five new Master’s programmes was held at the German University of Technolgy in Oman (GUtech). The five Master’s programmes have received the approval of the Ministry of Higher Education in Oman: A Master of Business Administration (MBA) will be a double degree, conducted in cooperation with the prestigious Vienna University of Economics and Business (WU), a Master of Science in Architecture and Urban Planning and a Master of Science in Applied Geosciences were designed in cooperation with GUtech’s partner-university RWTH Aachen. The MSc in Industrial Production and Manufacturing was designed in cooperation with the University of Brescia (Italy) and a Master of Science in Computer Sciences was designed in collaboration with Hasselt University in Belgium. The Master’s programmes include ample practical insights through internships and practical projects or modules. For example the MSc in Industrial Production and Manufacturing will offer six weeks internships conducted in Oman or abroad, e.g. at the University of Brescia and a MSc thesis and colloquium. Candidates of the MSc in Computer Science will have the opportunity to earn a second Master degree from Hasselt University, if they choose to spend one more semester at the University campus in Belgium. 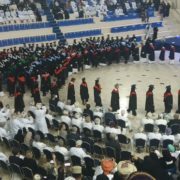 Scholarships are available for the first twenty Omani or international applicants and for all the Master’s programmes. HALBAN Under the auspices of H.E. Ayşe Sözen Usluer, the Turkish Ambassador to Oman, the exhibition “Fieldtrip Istanbul – Meeting East and West” of the Department of Urban Planning and Architectural Design at the German University of Technology in Oman (GUtech) was opened today morning. The exhibition showcases the creative work realised during the architectural excursion of the 7th semester students. “Every walk through the city can never be made in a seminar room,” said Prof. Ercan Agirbas who organised and supervised the excursion. The exhibition showcased at GUtech includes, Turkish Ebru painting art, students’ sketchbooks and a short film about the excursion. To learn more about contemporary art, the group of students participated in a special Ebru workshop at the Sanathane art studio. Ebru is the Turkish painting on water. The Turkish Ambassador was very impressed of the students’ artworks. Referring to their Ebru art paintings H.E. Ayşe Sözen Usluer, the Turkish Ambassador said: “After your graduation you will mix with other cultures and I hope you will contribute to harmony and peace in the world”. Prof. Ercan Agirbas explained the painting technique. “As an artist you are able to guide the colour. It is a result of your soul. You try to express your feelings on paper,” he said. During the one week excursion to Istanbul, the group visited many different places in Istanbul including the top tourist sites like the Blue Mosque, the bazar, the Museum for Turkish and Islamic Art and the Hagia Sofia, an important monument for Byzantine and Ottoman Empires which now serves a museum of the Turkish Republic. Throughout the entire week the group was guided by the Turkish tour guide Mr Attila Geridönmez. The students also visited the Turkish-German University (TAU) where they listened to different lectures and met with students. 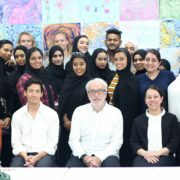 “As architects I believe we should travel to learn about other cultures,” said Aisha Al Hadrami, UPAD student. Due to the success of the excursion, Prof. Ercan Agirbas is planning to offer a summer school in Istanbul next year. The exhibition “Fieldtrip Istanbul – Meeting East and West” is open to the public during the opening hours of the university. Caption: Group photo with the UPAD students, the Turkish Ambassador H.E. Ayşe Sözen Usluer, Prof. Ercan Agirbas, as well as Prof. Wayne Swytzer of the UPAD Department. 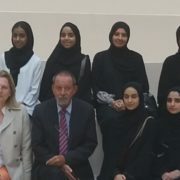 HALBAN As part of an official visit to the Sultanate of Oman, H.E. Dr. Karin Kneissl, Federal Minister at the Austrian Ministry of Europe, Integration and Foreign Affairs visited the German University of Technology in Oman (GUtech) on Thursday afternoon. The minister and her delegation was welcomed by the Rectorate, GUtech students and alumnis from different departments. Prof. Dr. Ing. Michael Modigell, Rector of GUtech, gave an overview of the development of the university and its achievements in the past ten years. The Minister then gave a talk on the energy transition and the growing importance of gas resources for world economies. “Oil was the main energy resource in the 20th century, gas will be the new energy resource for the 21st century,” said the Minister. The talk was followed by a short discussion with GUtech students. 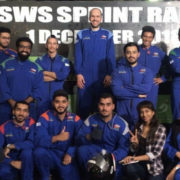 On Tuesday 13th November, Dr. Thomas Lattimore, a lecturer of mechanical engineering at GUtech and supervisor of the Engineering Club, visited the Muscat Speedway Karting Circuit with 17 students, mostly from the engineering department, for an Arrive & Drive Karting Event. During the event, 8 of the students along with Dr. Thomas and Mr. Nabi Traore (Junior Intern in the Department), completed a 15 minute race, which was followed by another 15 minute race, with 13 of those students, along with Dr. Thomas and Mr. Nabi. Overall, the students found the event a very good break from their studies, giving them the time to socialize with other students from the engineering faculty, and other departments, and time to have fun doing something related to engineering outside of the classroom. This event was organized by Dr. Thomas Lattimore with the Executive Board of the Club (Chaudhry Taimoor Niaz, Sadiyah Manidhar, Taima Al Hashimi & Shadhan Al Rashdi). A similar event is planned for Tuesday 19th March.